When it is time to purchase a new vehicle, don’t miss out on your chance to have the Jaguar EliteCare Advantage. This best-in-class coverage will offer you peace of mind to go with your exciting new vehicle! 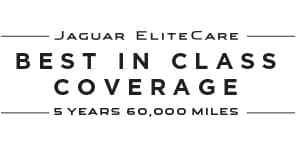 Jaguar EliteCare provides a 5-year / 60,000-mile warranty coverage and complimentary scheduled maintenance. It also includes 24/7 Roadside Assistance anywhere in the U.S. as long as your vehicle is under warranty. The included Jaguar InControl technology allows you to stay connected to your Jaguar with just the push of a button! Contact Jaguar Colorado Springs for more information on EliteCare. We would love to tell you all about the many benefits. Let us introduce you to the exciting Jaguar vehicle line-up that includes Jaguar EliteCare.